August is actually very close to being over, but there is no doubt in my mind that the following questions will also be thought of well into September. In order to make this a little more thoughtful, I've decided not to use the "Will Mats Sundin be playing for us" question for the Maple Leafs, Canadiens, and Rangers. Instead, those teams have some other questions to mull over - as do 12 others. Atlanta Thrashers - Will Coach John Anderson's Streak Continue? He won a Colonial Hockey League championship with the Quad City Mallards in 1997 and spent the last 11 years as coach of the Wolves, winning two Turner Cup titles when the team was in the International Hockey League and two more after a shift to the AHL. Anderson's regular-season coaching record is 506-99-283, and his playoff mark is 105-60. For those keeping track, in 13 years of coaching, John Anderson has never had a losing season. That all could change as Anderson gets ready to become the fifth head coach in Thrashers history. Hired in June, Anderson will have the challenge of getting a team lead by the likes of Ilya Kovalchuk and, uh, well, Ilya Kovalchuk back to the playoffs. After a disappointing 14th place finish in 2008, the Thrashers will be counting on promising sophomore defenseman Tobias Enstrom and rookie Zach Bogosian (3rd overall pick in 2008) to mature quickly and make the Thrashers a tough team to play against. Last season, the Thrashers were ranked 29th on defense (3.24 GAA) and are hoping that newly acquired Ron Hainsey will help protect Kari Lehtonen's goal this year. Anderson will need to find a way to get offensive production from the likes of Colby Armstrong, Vyacheslav Kozlov, and Erik Christensen or else the Thrashers are in for a long season. Boston Bruins - How many goalies are allowed on our roster? It always seems that the Bruins need a goalie, doesn't it? The NHL only allows for two goalies to be dressed during any given game, but I'm thinking the Bruins could find a way around that. 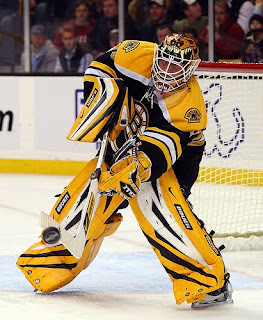 Maybe they could dress Tim Thomas and backup Manny Fernandez and then let Tuukka play as a defensemen? But seriously, it actually seems that the Bruins have finally found their permanent starter in Tim Thomas. He posted 28 wins last year with a 2.44 GAA and .921 SV%. Then again, didn't Andrew Raycroft post similar numbers as a rookie? And look where he's ended up. Buffalo Sabres - How do we eliminate the shootout? Ever since the shootout has been implemented, there has been constant debate about its place in hockey. Some say it ruins the "team concept" of hockey while others say it's exciting and helps draw new fans in. Last season, Buffalo missed the playoffs by a measly four points. Their record in the shootout? Had they gone 8-5 in the shootouts, the Sabres would have been in the playoffs, not the Carolina Hurricanes. This sort of scenario begs the question - is the shootout a fair way to determine a winner? I'll put it to you this way. The Oilers (15-4) say yes. The Sabres say no. What does your team say? Carolina Hurricanes - Why did Joni Pitkanen cost so much? One of the NHL’s long-rumored deals finally took place today, as the Edmonton Oilers traded defenseman Joni Pitkanen to the Carolina Hurricanes for forward Erik Cole. The Hurricanes apparently tried to acquired Pitkanen last summer from the Philadelphia Flyers before he was dealt to the Oilers, and while Edmonton GM Kevin Lowe had hoped to re-sign Pitkanen, a restricted free agent, his acquisition of Lubomir Visnovsky signaled the Finnish blueliner wouldn’t be an Oiler much longer. I've never been very high on Pitkanen and obviously I'm missing something. But what is it exactly that I'm missing? Is it his -30 rating over the last two seasons? Or maybe it's the fact that he's a defensemen who has never played a full season in the NHL. Could it be the minor detail that Pitkanen has only eclipsed the 10-goal mark once in his NHL career? Actually, I think it was his 26 points in 63 games last season. For a guy who is supposed to be on the top pairing in Carolina, I don't see how Pitkanen for Cole was a good move. Cole, who has had injury problems of his own, has scored at least 20 goals in each of the past three seasons (including 30 in 2005-2006) and was a key member on Carolina's 2006 Stanley Cup team. It isn't that Carolina didn't need a puck-moving defenseman. I'm just wondering why they had to give up a consistent offensive weapon to get a mediocre one. Florida Panthers - Please, can we re-do the Luongo trade? I mean, really. They're being lead on offense by Stephen Weiss and Nathan Horton, have Noah Welch set to be their 5th or 6th defenseman, and are being harrassed by Jay Bouwmeeser trade rumors. Move them to Canada already! Montreal Canadiens - Can we win the 25th in the 100th? The Habs will be trying win their 25th Stanley Cup this season. This season - the 100th season. And as you'll see in a few weeks, Montreal will be my choice to fulfill that dream and win the Stanley Cup in 2009. Assuming Carey Price can rebound from a horrific playoff series against the Flyers, the Canadiens aren't going to have any problem providing goal support with the Kostitsyn brothers, Tomas Plekanec, Alexei Kovalev, Chris Higgins, Saku Koivu, and one of my favorite players, Alex Tanguay, leading the way. The defense is a solid bunch and the entire team is being lead by Guy Carbonneau, a Jack Adams candidate last season. As far as the expectations go, they're obviously high for a team that performed well above last year's expectations. But in a division featuring the Toronto Maple Leafs, the Habs will be just fine. New Jersey Devils - Is it time to give Martin Brodeur a rest? Since the lockout, Martin Brodeur has played 228 of the 246 regular season games for the New Jersey Devils. In those three years, the Devils haven't even gotten close to the Conference Finals. Brodeur isn't a young man anymore. Having just turned 36, Brodeur has always been a workhorse. He's played in at least 70 games 11 of the last 12 seasons and he's just 13 wins away from Patrick Roy's all time wins record of 551. But if the Devils want a chance to go back to the Stanley Cup, they'll be smart to limit Brodeur to around 60-65 games this season and allow veteran Kevin Weekes to fill in much more often. But Brodeur did not get much help from his defensemen against the Rangers, and Brent Sutter, the first-year coach, called Brodeur “mentally tired” after the Rangers’ 5-3 victory Friday eliminated the Devils. Hopefully for the Devils, Sutter learns from this experience and gives Brodeur more rest during the regular season. New York Islanders - Why is our marketing team so smart? Each time the Islanders win a game in the four-game Victory Plan package, you will get to come back and watch another select game - on us! For example if the Isles defeat the Sidney Crosby-led Pittsburgh Penguins on November 26, you get to return to the Nassau Coliseum on December 16 to see Alexander Ovechkin and the Washington Capitals for FREE. But the Islanders have decided to take it upon themselves to make sure they have an arena full of fans screaming for a win. Haven't you even noticed that watching a game on TV is that much better when there is a crazy crowd cheering in the background? And keep in mind that the Islanders didn't make this a Panthers-Coyotes special. Fans are going to have the chance to see Alex Ovechkin for free. New York Rangers - Will the replacements come to play? The Rangers lost Sean Avery, Jaromir Jagr, and probably Brendan Shanahan on offense and didn't exactly upgrade during free agency. New York signed aging star Markus Naslund (55 points last year) and Nikolai Zherdev, who they hope can finally truly breakout in the Big Apple. Assuming Sundin doesn't come to play for the Rangers, they'll need Naslund and Zherdev to provide secondary scoring for Scott Gomez and Chris Drury if the Rangers want to return to their first Final since '94. Ottawa Senators - What the heck is a second line? A second line? That's crazy. And what's up with all of this goaltender depth business? Philadelphia Flyers - Are we overrated? Despite living near Philadelphia, I have always had an extreme dislike for the Flyers. Last season, they went from the worst team in the NHL to one of the best. After losing to the Penguins in the third round of the playoffs, the Flyers are expected to challenge once again for a spot in the Finals. But are they just a tad overrated? Scoring shouldn't be a problem. A half-healthy Simon Gagne, alongside Daniel Briere, Mike Knuble, Scott Hartnell, Joffrey Lupol, Jeff Carter, and probable captain Mike Richards give the Flyers a very good set of scorers. Defense, however, is a different story. Ryan Parent and Randy Jones are still inexperienced, while Ossi Vaananen has been thought of as "over-the-hill" since he left Colorado. Kimmo Timonen is a very solid #1 but he doesn't deserve the 8 million he'll be making this season. His partner Braydon Coburn proved to be very reliable last season as well. After the top 6, depth becomes a problem. Steve Eminger, a newcomer from Washington played in just 20 games last season and Lasse Kukkonen hasn't done enough to make me feel comfortable if he's called upon. In goal, Martin Biron posted 30 wins last season but was streaky at times last season. But if he goes down, will Nittymaki be able to answer the call? A potential problem is the flexibility to make in-season moves. The Flyers have spent up to the cap and won't be able to make a big in-season adjustment. Most experts will be picking the Flyers to finish anywhere from 1st through 6th in the East but I expect them to be simply trying to hold on to a playoff spot coming down the stretch. Pittsburgh Penguins - Will there be a letdown? The Pens lost Marion Hossa, Ryan Malone, Gary Roberts, and Jarko Ruutu on the Wings and could only replace them with Ruslan Fedotenko, Miroslav Satan, and Matt Cooke. "I just couldn't live on one healthy foot anymore, let alone try to skate," Whitney said Thursday, on the eve of his surgery. "We've tried everything to avoid surgery because we knew it would mean missing a chunk of the season. But nothing worked." With two of the league's best players and a legititmate #1 goaltender, the Penguins should have no problem being one of the top teams in the East. Tampa Bay Lightning - Is it all in the hair? Scotty Wazz, host of the Faceoff Hockey Show put out a great post on why Barry Melrose won't help the Lightning. If you haven't heard, the Tampa Bay Lightning signed Barry "The Mullet" Melrose to be their new head coach. A man who hasn't been in the league in 13 years, a man who has always been better suited to be an analyst than a head coach has been named head coach of a NHL team over the likes of Bob Hartley, Marc Crawford, and Joel Quenneville. Read that post and you'll get a sense of what Tampa is asking themselves this season. How could we hire a guy who is known more for his hair than his coaching? Toronto Maple Leafs - Will we finally give our fans the #1 pick they deserve? Let the chase for Tavares BEGIN! From the atrocious contract awardred to Jeff Finger to the embarassing depth on offense, the Maple Leafs are going to be an easy two points this season. The Leafs have had a habit of getting hot at the end of every season and managing to miss out on the each year's top prospects. Expect this year to be a total tank fest. Washington Capitals - Can we top ourselves? What the Caps did was nothing short of incredible. The question is, can they Jose Theodore duplicate the success that he had in Colorado in Washington? Either way, it's going to be exciting to watch. The NHL season begins in less than 41 days and many of these questions will begin to be answered.